Our Mealtime Waterproof Bibs are made of environmentally friendly materials,non-toxic, completely waterproof and resist most stains. You are able to wipe it clean with a tissue or a cloth and don't even needs to be completely washed after each use; also easy to rinse clean and dry very quickly. It is lightweight and easy to pack up for travel or for dining out. 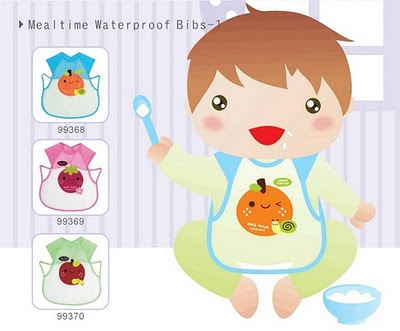 Available in different styles designed to take baby from first foods all the way to art projects in preschool.